There is a sense of order and peace around today which will facilitate your ability to get on with what you need to do and do it well. It is as if you have 2 paths ahead of you or perhaps you are incorporating two different ways of looking at the same problem. On one hand you are grounded and practical and want to plod along and get ahead in the same old way you always have yet on the other hand, which can be seen from the green dragon resting on your arm, there is perhaps a path you would like to take that is totally different to just practically plodding along… a path that is more filled with adventure and where things happen at the drop of a hat. I wonder which you will choose especially as Saturn trines Chiron today and gives you a chance to bring together that from your past which has possibly been holding you back and allows you to come up with new ideas and plans to put into motion that may not have been possible in the past. Whichever way you go you will feel peaceful and focused. The flowing robes and colours in this card suggest that you are well in tune not only with yourself but also your environment and the background images, a sea port on one side and a hill on the other also give you further thought for any choices you wish to make. Allow yourself to be your own best guide today, as it seems from the vantage point of the Hierophant on the hill you have already overcome hurdles to journey as far as you have. Whatever dream you have for your destination it looks as if you travel towards it with an open and wise heart.Enjoy the self love you have around you today and wrap yourself in it allowing Chiron the healer and Saturn the planet of wisdom to guide you to your next step. 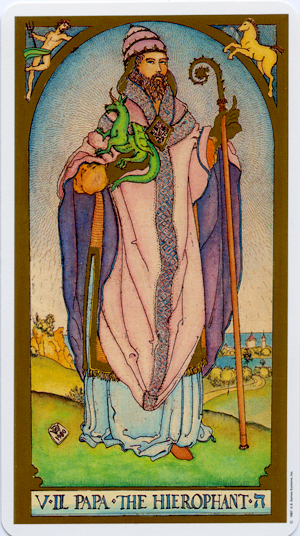 Today’s card — the Hierophant — comes from the Renaissance Tarot by the late Brian Williams, whose vast contribution to the tarot community is unparalleled. He also brought us the Ship of Fools Tarot and the PoMo Tarot. This deck was published by U.S. Games.